In professional recruitment and assessment, you need to gain the most powerful insights into the driving forces behind a personality. A DISC profile can give you that insight, drawing on an industry-standard psychometric technique to create the most advanced individual reporting available anywhere. Based on a simple and straightforward personality questionnaire, we can compile a detailed and informative report that tells you everything you need to know about a person, from their inner motivations to their working style. A DISC report explains the overall personality of any individual, and also looks in detail at the way they're likely to perform their job. The report looks at key areas such as motivation, communication style and decision making to describe a person's work style in truly practical and useful ways. The most extensive version of the report goes further, exploring a candidate's suitability for particular roles in management, sales, service and technical work. You'll also find detailed descriptions of their approach to working relationships and teams, and the report will even give you a selection of questions for a behavioural interview. We provide a powerful and cost-effective DISC profiling services, giving you everything you need to manage DISC profiling in a single package. Create a profile from any of the built-in test questionnaires, and an expert interpretation system will give you a complete assessment within moments. We also provide you with a host of extra features, from job matching to relationship assessment to team building and beyond. All these extra services are available free and unlimited. Recruitment can be a challenge: finding the right person for the job can be critical to success. Understanding drive, motivation, ambition and other personality traits is more important than CVs and personal judgement alone. A DISC profile gives that crucial understanding and much more (for example, it can even suggest behavioural interview questions). If you work with people, you need to be able to assess their current situation, their needs, and the way they interact with those around them. DISC is the essential psychometric tool to help improve individual performances, relationships and teams in the workplace. DISC has applications for every part of business, from management to sales, to service and beyond. Help your people learn to communicate more effectively, plan their management approach, strategise sales and negotiation. We can help you in all these areas with remarkable results. Its combination of sophistication and ease-of-use has made DISC one of the most successful profiling systems in commercial use today. Not only is it widespread in business, it also has a strong theoretical underpinning. You can find out more about the specific validity of reliability of the our personality profile solution in the independent Roodt Report. We provide a completely automated DISC test questionnaire service. Questionnaires can be presented on the screen in a format simple enough for anyone to use, and once completed, the answers are compiled and analysed automatically. If you prefer to use paper DISC questionnaires you can still print them directly, and then enter the answers in seconds. One of the advantages of cloud-based profiling is that you can provide a DISC test directly across the Web. Candidates can complete a DISC questionnaire on the Web, wherever they are, and the results are instantly available. Once a DISC test has been completed, its built-in expert system will instantly compile an exhaustive and clear report. 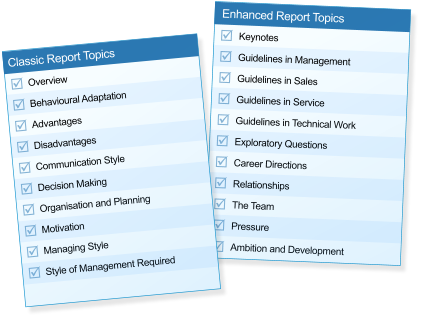 Our DISC reports are written in plain English (and are also available in many other languages) covering a huge range of topics and subject matter. DISC reports are available instantly on-screen, but if you need to distribute or discuss them, they can also be reproduced in high-quality PDF. PDF (Portable Document Format) is an industry standard that lets you easily share reports in printed form, by e-mail, or across the Web. Our DISC test solution is completely cloud-based. You can even set up a network of users, so you can easily share reports and analyses, and collaborate with others to discuss your findings.